JR Motorsports has been running a pair of GT1 class Nissan GT-R's in the FIA championship this last year. 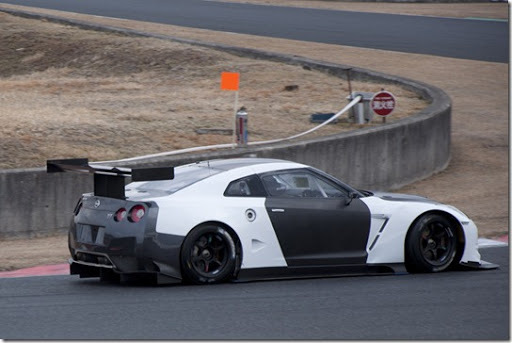 They are also the parent company of Sumo Power that ran R35's since 2010.Now Nismo has annouced that they are going to be working with them on a GT3 project. No annoucement on the specs for the GT3, but expect 450-500 hp, and rear wheel drive. The above picture, it looks like the GT3 car is narrower than the GT1 car, closer to the street car. Check out the press release below. When more information becomes available, it will get posted here. NISSAN Motorsports International Co., Ltd. (Headquartered in Minami-Ooi, Shinagawa-ku, Tokyo. President: Shoichi Miyatani; hereafter NISMO), following its FIA GT1 World Championship project with JR Motorsports (Headquartered in Rye, East Sussex, UK. Executive Director: James Rumsey; hereafter JRM) has entered into a partnership tie-up with the firm to run its FIA GT3 project using the NISSAN GT-R.
NISMO is jointly advancing the development of the FIA GT3 specification NISSAN GT-R with JRM, with the car scheduled to make a number of test appearances in Europe and Japan during the 2011 season, ahead of the car becoming available to customer teams in 2012. JRM will be the official motorsport partner of NISMO for the project, in charge of on-going testing, development and production of the car & parts in Europe, whilst also taking care of customer sales and support throughout UK, Europe, Russia and the Middle East territories. JR Motorsports (JRM) is a British motorsports company, widely known for its successes in FIA GT1, Group N rally and production circuit racing where it is an established rally/race car manufacturer with factories in Rye, East Sussex and Daventry, Northants, UK. In addition JRM is also the parent of Sumo Power which is widely known for the sale of tuning components as well as Sumo Power GT, its FIA GT1 race team. In 2010, NISMO and JRM concluded a partnership agreement for the FIA GT1 World Championship project. JRM started the Sumo Power GT team, commencing their participation in the FIA GT1 World Championship with the NISSAN GT-R. For 2011, in addition to Sumo Power GT, the new JRM Racing team was set up as a subsidiary of the JRM Group. In Round 3 of this year's championship (in Algarve, Portugal) the team's cars won both the Qualifying and Championship races.